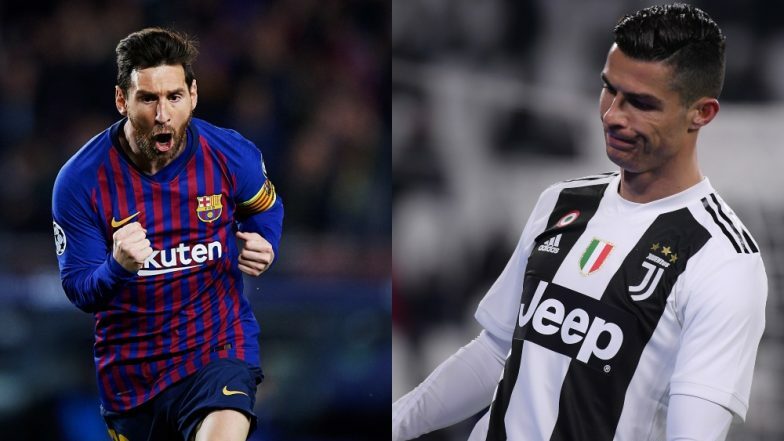 Barcelona, April 17: FC Barcelona booked their berth in the Champions League semi-finals for the first time in four years riding Lionel Messi's brilliance, while Ajax stunned Juventus to keep their juggernaut rolling. Messi netted twice in a 3-0 home win on Tuesday as Barcelona sealed a 4-0 aggregate victory and will meet either Porto or Liverpool in the last four. Messi collected a misplaced pass from Ashley Young to curl it into the bottom corner in the 16th minute. David de Gea Memes Flood After Barcelona Knock Manchester United Out of UEFA Champions League 2018-19 Quarter-Final Match, Check Out Man United Goalkeeper's Epic Mistake. Philippe Coutinho rounded off the utterly convincing victory for the Catalans by curling into the top corner in the second half. Meanwhile, Ajax continued their giant killing act after eliminating Real Madrid by producing a spell-binding display of passing football to win 2-1 away to Juventus. Reaching the last-four stage for the first time since 1996/97, Ajax's 19-year-old captain Matthijs de Ligt headed the winner from the corner in the 67th minute of the quarter-final second leg as the Dutch side came from behind to clinch a 3-2 aggregate win. Cristiano Ronaldo, aiming for a fourth consecutive Champions League title after winning the last three with Real Madrid, gave Juventus the lead ahead in the 28th minute with an emphatic header, his sixth goal of the competition. Ajax Eliminates Juventus from UEFA Champions League 2018-19 Quarter-Finals! Cristiano Ronaldo's Team Gets Brutally Trolled. But Donny van de Beek levelled six minutes later before the visitors swept Juventus aside in the second half. Can we can go on to win the competition? Well, we are in the semi-finals now. And we have eliminated two of the favourites in the last two rounds. The next games will be very difficult, but so were these ones. So who knows?," said De Ligt after the game.